It appears that just a few hours ago, the prominent “Boycott BP” Facebook fan page has completely disappeared from the site. Posting on CNN’s iReport, a section of the news site dedicated to letting “real people” report the news, a member known as yadayadatwin suggests that Facebook has removed the the page, severing connections with almost 800,000 of the groups members. This group was created with the intent of sending a clear and strong message to BP and to Washington that what has happened in the Gulf has to stop everywhere. People from all over the world shared video clips, pictures, and frustration over what has been seen incredibly slow process to an ever growing economic and environmental disaster. 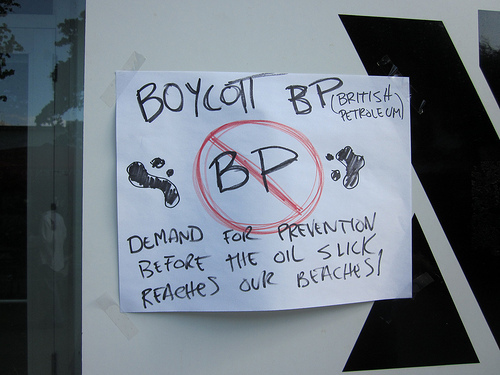 The groups creator, Lee Perkins, has also been subject to media interest with many media outlets focusing on the Boycott BP movement, helping to increase the number of members on the Facebook page. The question is, did Facebook take down the fan page? If so, why? There has been a lot of public interest in satirical social media accounts that focus the spotlight on the disaster, especially BP Public Relations account on Twitter, an account that has amassed over 180,000 followers in just over a month. Facebook has been called into action to delete Italian neo-Nazi groups in the past as the group violated its terms of service but for a company that “supports the free flow of information, and groups provide a forum for discussing important issues” the deletion of a public forum to discuss the largest offshore oil spill in US history could land Facebook in some very hot water. Perkins took it upon himself to create a new Facebook group (which can be found here) which has already managed to gain 6500 new members in a matter of hours. As they say, where there’s a will, there’s a way, the group leader is doing his best to get the message out there. We have reached out to Facebook for comments, we will update as soon as we hear anything. Update: It appears the Facebook page has resurfaced. We had received a filler email from Facebook’s PR but nothing official. We wonder if the page was taken down in light of a complaint, only to be pushed live again once the complaint was dismissed. There you have it, seems to hold true when you factor in how quickly the page came back up.